intuVision analytics, on the edge. Add our intelligent object detection and tracking to your smart cameras, robust analytics without additional hardware. intuVision's powerful video analytics is available in your smart camera! Our edge analytics are developed to run directly on your camera,eliminating the need for additional hardware. Available on Axis, Cisco, and Samsung cameras, our edge analytics are easily setup via the camera's web interface and when an alarm condition is detected, various actions are triggered, such as sending email notifications, play audio clips, and sending triggers for 3rd party devices. Working with the intuVision Event Manager, you can store and manage events, view cameras, create graphs and other visual representations of your events. Person detection feature is available for relevant applications. We are currently compatible with all Axis cameras with ARTPEC-4, -5, and -6 chipsets. For questions about specific camera models, please contact us. We are currently compatible with the following Cisco IP camera models: CIVS-IPC-283x, CIVS-IPC-3xxx, CIVS-IPC-6xxx, CIVS-IPC-6930, CIVS-IPC-7xxx, and CIVS-IPC-8xxx. We are currently compatible with all camera models within 5004, 6004, and 7004 series. Additional cameras are added to our compatibility list frequently. Please contact us if you have questions regarding a specific camera. Please contact sales@intuvisiontech.com if you have questions regarding a specific camera or other chipsets or to enhance your smart camera with effective and affordable event spies to protect your secure facilities, monitor traffic or to enhance your business. Our wide listing of events on the edge are capable of helping you provide security, count customers, and manage your facilities, Events such as line crossing can even be used in factories to count items being manufactured, and more. Our Activity spots activity of legitimate moving objects within a user-drawn "activity zone". 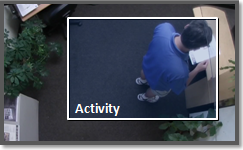 Activity can be used to detect the presence of moving objects in the selected areas whether it is people around a store display, a vehicle in a docking zone, or even illicit dumping into your dumpsters. Activity reports only the true activity going well beyond commonly used pixel-based motion detection algorithms which are prone to false-alarms. Enter/Exit application detects objects that enter and/or exit a scene via a selected zone. This is used typically to detect people entering and exiting a store or business for the purpose of people counting, or to detect vehicles entering and exiting a parking area. On select cameras, person classification can be used to ensure you get the alarms you want and none you don't. This is our recommended people counting application. 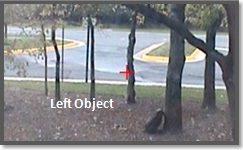 Left Object detector monitors your scene to detect when a person or vehicle has left an object and moved a specified distance away. Detector can be used in airports, schools, shopping areas, and more to detect suspicious left objects. Alternative use is in parking areas or by dumpsters to detect illegal dumping in private areas. 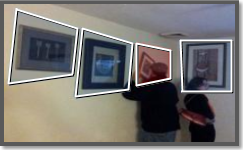 Our Object Taken detector will secure your fixed assets by detecting a marked object being removed from its location. Object Taken can be used to protect valuable assets such as art, wall-monitors, or other stationary valuables. 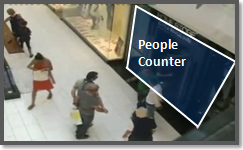 intuVision Edge People Counter counts, manages, and reports customer counts into stores or as customers pass through store corridors. All count management is done on the edge, and reports can be generated and viewed onboard the camera. 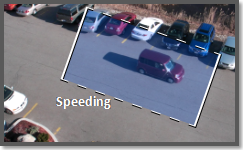 The Speeding Object application detects objects that pass too quickly over two user defined lines. Simply draw your two lines, select the approximate distance between them, and the accepted speed limit in that area, and the application will alarm when it is exceeded. This is useful both in collecting general speed metrics for a specific location and for apprehending specific drivers who routinely exceed the limit. Throughput detects moving objects passing both active edges of the throughput zone. 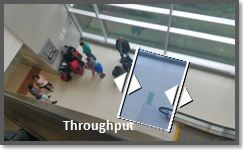 Throughput can be used to monitor foot or vehicle traffic, and to count people and vehicles entering and exiting an area. 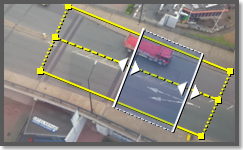 The crossing direction can be specified to detect objects moving left-to-right, top-to-bottom, both-ways etc., as well as an object crossing the line fully or partially. intuVision Vehicle Counting allows for effortless counts, separated by lane. Vehicles must cross over both active edges of the counting zone, in the specified direction, which allows for turncount and reduction of false alarms. Roadway lanes are drawn as in the snapshot, and vehicles passing through each lane are marked as such. All count management is done on the edge, and reports can be generated and viewed onboard the camera. 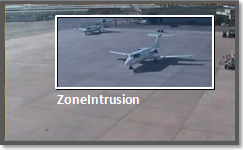 Our ZoneIntrusion detects objects entering into a user-drawn zone from outside of the zone. This spy can be used the detect and count people entering or exiting a building or intruding into a marked area. Whether to catch a vehicle leaving the road, or to send someone for customer assistance in a specific area of the store, this edge analytic will enhance your security and your services. 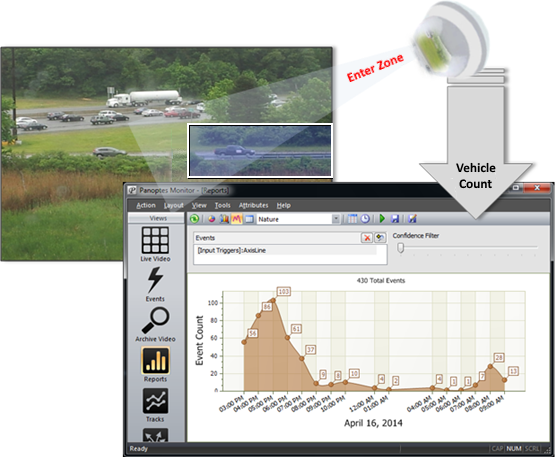 Manipulate event and alarm data from the edge - make the most of your edge analytics. intuVision edge analytics provide a great tool for low-cost video event detection, our Event Management tool lets you go further with the analytics from the edge devices. Simply create an action rule on your camera and link that to an intuVision input trigger to view events, create compound events, and produce statistical charts and graphs based on event occurrences. Event Counting: generate event counts to determine customer visits, building occupancy, road travel, etc. Event Search and Graphing: Gain a holistic view of customer visits, with event counts and graphs. Easily view a wide variety and export graphs of interest to share findings. Compound Events: Increase alert reliability with compound events. Combine two similar events, multiple instances of the same event, or two disparate events into one alarm. 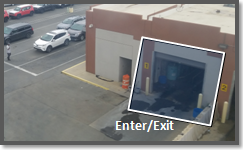 Floor-Map View: View event alarms within the context of your facility. As this is the same review application that comes with intuVision VA, this will allow you to create simple and intuitive split deployments, with simple scenes protected by edge analytics, and more challenging scenes protected by server based processing, with intuVision VA. All events can seamlessly be reviewed in the same application, reducing complexity for your security team.